I want to encourage you today. Maybe your house isn’t clean, your gifts aren’t wrapped or you don’t have the finances to purchase gifts, and you won’t have time to bake the cookies you wanted to make. It’s okay. Christmas will come and go, and more than our family wants us to have everything perfectly done, they want us to be present and pleasant. And you know, there’s so much beauty in the undone. There’s beauty in the imperfect. And we can find joy amidst the mess and the tight budgets. Embracing an Imperfect Holiday – on Beauty through Imperfection. The Christmas Cookie Disaster – Sometimes it’s easy to think that other people’s Christmases are perfect and beautiful all the time, but that’s simply not true. In this post about my nearly disastrous cookie baking experience, I share how I finally realized that my attitude matters more than the circumstance. Why We Simplified Christmas This Year – by Money Saving Mom. Dealing With Difficult Relatives During the Holidays – on Worshipful Living. 22 Themed Gift Ideas for Everyone on Your List – If you’re trying to think of a last-minute gift for someone on your list, then read this article. Not only are there 22 great themed ideas, but each idea is also frugal and (mostly) clutter-free! Plus over 30 other gift lists are included in the link-up on this post so you’re sure to find some fantastic inspiration. 10 MORE Themed Gift Ideas for Everyone on Your List – Whether you’re looking for stocking stuffers, need a last-minute co-worker or family gift, or just want a little fun inspiration, you’ll definitely want to check out these neat ideas. Celebrating a Memorable Christmas on a Zero-Dollar Budget – by Brandy at the Prudent Homemaker. Last Minute Holiday Sanity-Saving Tips – If you need to simplify your holiday to-do’s but aren’t sure where to start, then check out this article for practical tips and encouragement. How to Keep Your Kid’s Christmas Gifts From Taking Over Your House – This was one of the most brilliantly simple ideas I’ve ever had and I just had to share it. How to Fake a Clean House in Less Than 20 Minutes – If you want a cozy feel amidst the chaos in your home this Christmas, or if company is coming on short notice, then you’ll definitely want to see the tips in this article. Simple & Elegant Christmas Dinner Menu – This is what I’ll be making for Christmas Dinner this year. Maybe you’ll see a few ideas that you like? 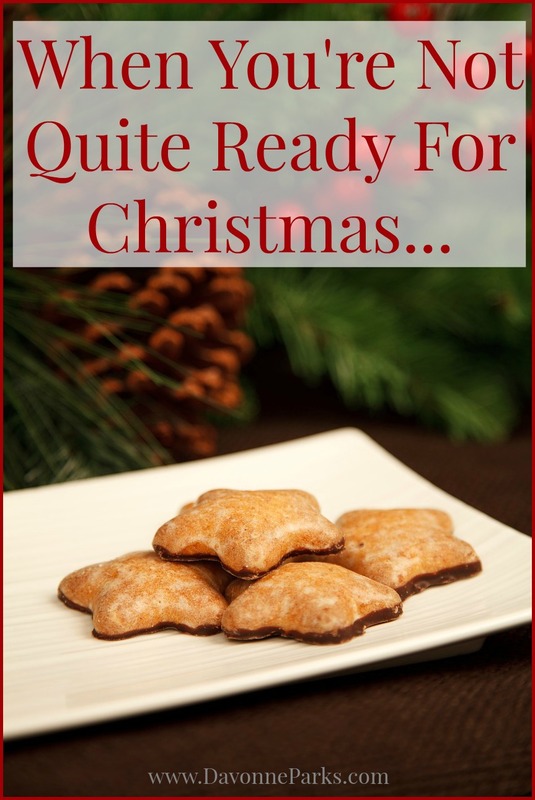 25 Frugal Days of Christmas – Check out this link-up for crafts, recipes, and other fun ideas. Cinnamon Applesauce Ornaments – My friend Stephanie introduced me to these Christmas tree decorations, and they’re absolutely wonderful! These are so easy that my five-year-old can make them almost completely by herself and these beautiful ornaments make the house smell amazing. A Cute and Easy Way to Display Greeting Cards – If you’re looking for a quick way to display your greeting cards, then simply put them on a bookshelf or try this idea. And I’d love to know: how do you display your greeting cards? Christmas In The Midst Of Our Mess – by the Nester. You can read all of my Christmas articles here or see my Christmas inspiration board on Pinterest. What’s one thing you do to simplify Christmas preparations?